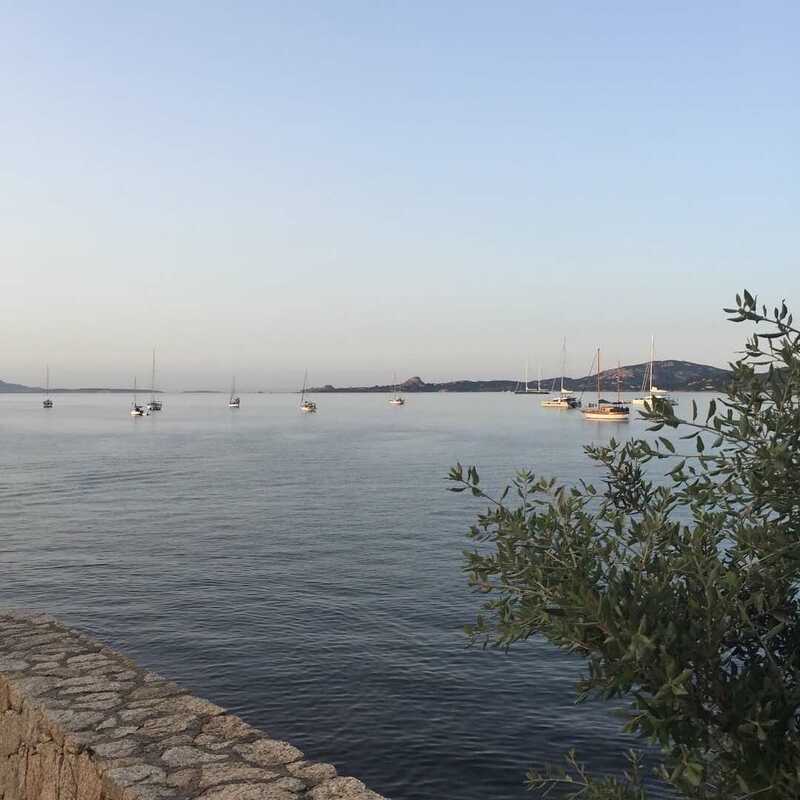 When we left Porto Conte we said goodbye to Susan, she would go South whereas we would continue to Northern Sardinia. 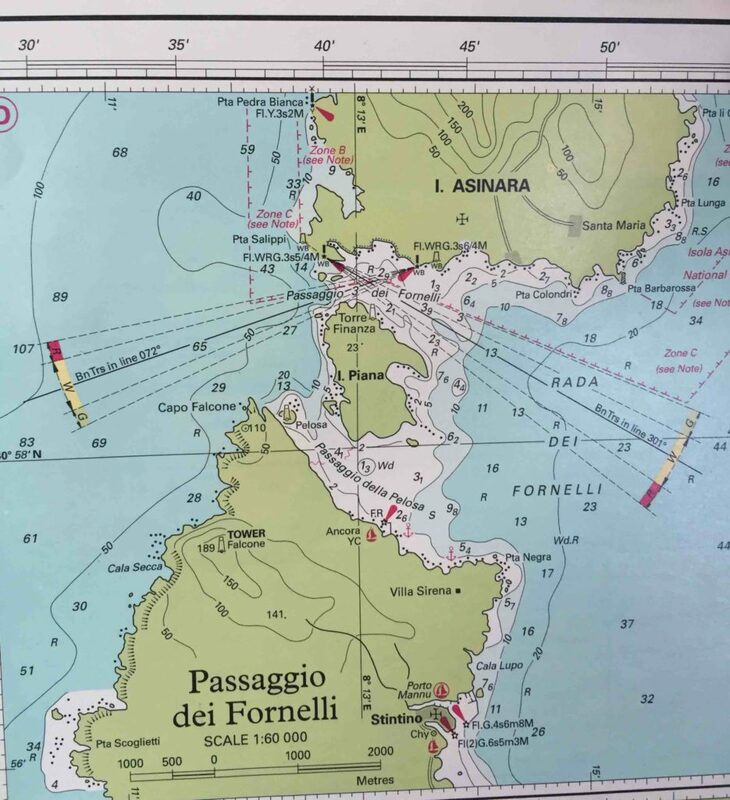 We could have gone around the island of Asinara but instead we opted to go through the narrow and shallow Fornelli passage which would save about 20 nm. The minimum depth of this channel is about 4 meters but only if you follow the correct route. A few meters off track and you’ll find yourself in 3 or even 2 meters of depth. The route is indicated by transits: two objects on shore which once lined up indicate you are on the correct course. After the initial track, a turn to about 40 degrees starboard is required, as indicated by a different transit. As we had not done such a tricky passage before, we lowered the sails and went through on the engine. Just to be sure we were going the right way, we zoomed right in on our chartplotter and I also kept Navionics on the mobile nearby. Even with these tools we struggled a little bit to find the objects on land that were supposed to line up. We are still not sure which set of objects on land were supposed to be the second transit, but thanks to our modern technology (and a boat in front of us that we also kept a close eye on) we followed the correct track. It only took about 15 minutes to cross the passage. Once on the other side we were welcomed by the clear blue waters and sandy bottom of La Pelosa. After we had settled in, we blew up the dinghy and took the dogs for a walk on the nearby island. Oivind keeps a labrador named Birk on board who was, just as Puppy, very eager to run around on the shore. This was the first time they met and they got on well: due to their difference in sizes they weren’t exactly equal playing partners so they mostly ignored each other but at least there was no animosity. 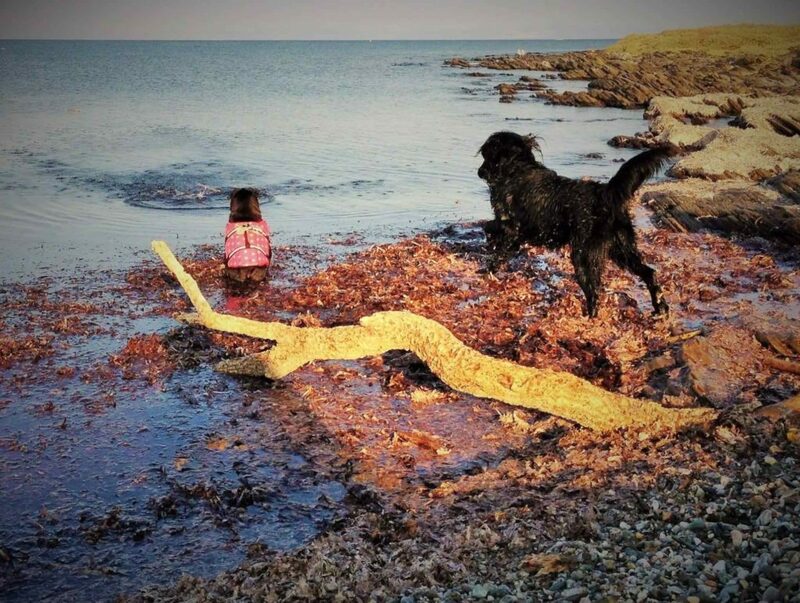 Puppy was very eager to join in with the stick-fetching game Birk was playing but she didn’t dare venture so far in the sea and in any case, Birk was much faster than she was. Luckily dogs are not inclined to sulking or feeling offended so they both still had an awesome time. Thanks to the sandy bottom and the clear water the visibility was amazing. We went on a snorkelling mission but didn’t see that many interesting fish. There had been more abundant wildlife in previous anchorages in Formentera and Mallorca. We did see some big clam shells on the bottom and one of them housed a little squid which just peeped its head out. The shore closest to us contained mainly resorts and tourist apartments – not very interesting to visit. A bit further away was the little town of Stintino, so we decided to go for a long dinghy ride to check it out. 40 minutes later we arrived in the little marina. 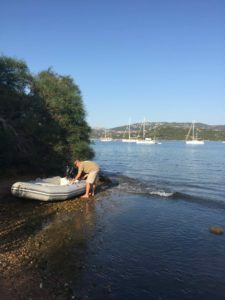 It was not very obvious where we could tie up the dinghy but there was some space on a quay next to a moored motorboat that looked non-commercial so we left our 3 dinghies there. 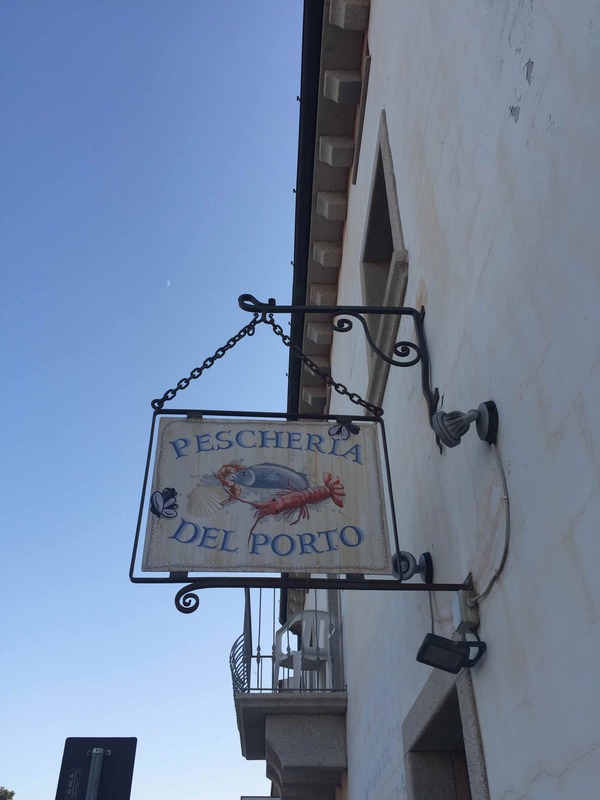 After admiring the local architecture, the gelaterias and making a mental note of the supermarket and butchers, we simply had to go for a pizza – being in Italy and all! Most restaurants looked fairly expensive but we noticed a kind of hole in the wall place that had just opened its doors. The kitchen staff was still tying on their aprons but we were friendly welcomed in. The waiter kindly explained to us that they were not allowed (due to their license presumably) to bring the drinks and food to the table. So we could take our own drinks from the fridge and pick up our pizzas from the counter. 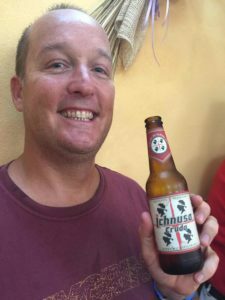 We opted for a local beer called Ichnusa. The label of the bottle attracted our attention as it displayed the Sardinian flag which depicts a red cross with four blindfolded Moor’s heads. 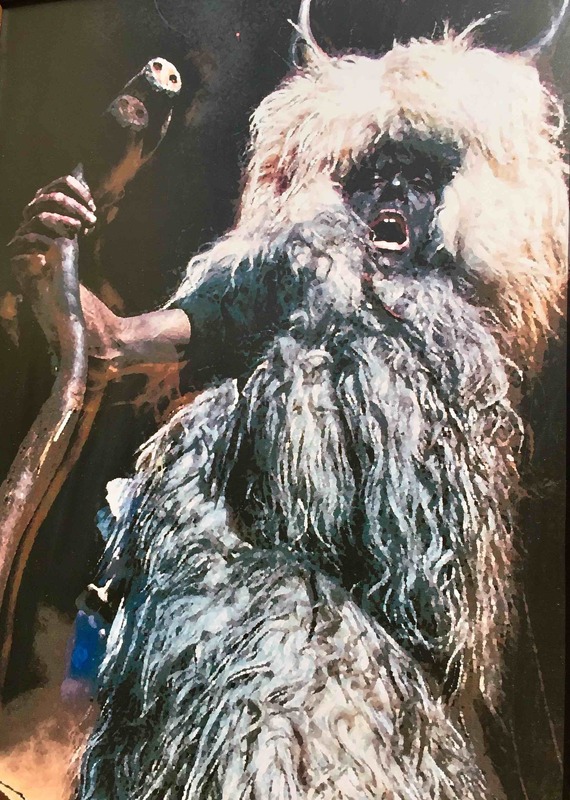 The exact origins of this image is unclear. According to Spanish tradition it was a creation of King Peter 1 of Aragon, celebrating his victory thanks to the intervention of St. George at a battle in 1096. This would explain the George’s cross (the white background and red cross). The four heads would be four slaughtered Saracen kings. 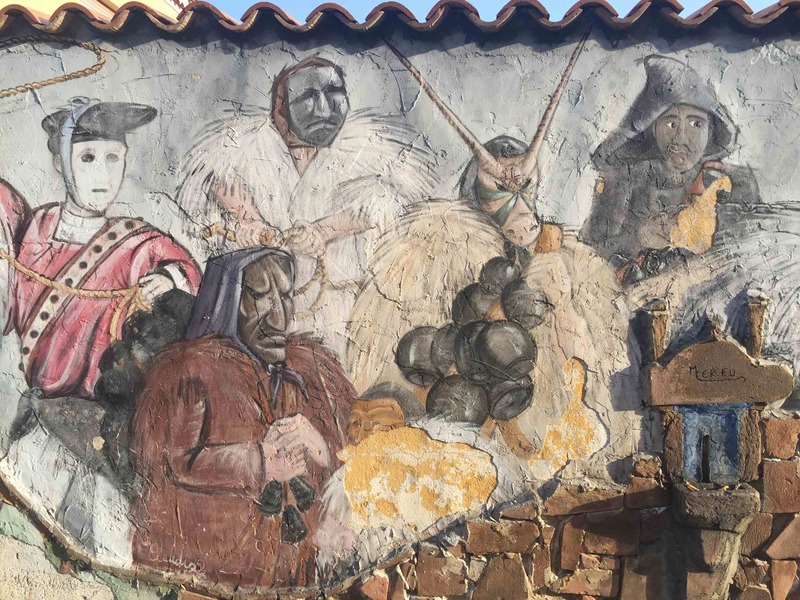 Another explanation is that it refers to the Spanish reconquista against the Moors. The heads could either represent holy warriors or Moor heads cut off. In any case, the beer went down well. 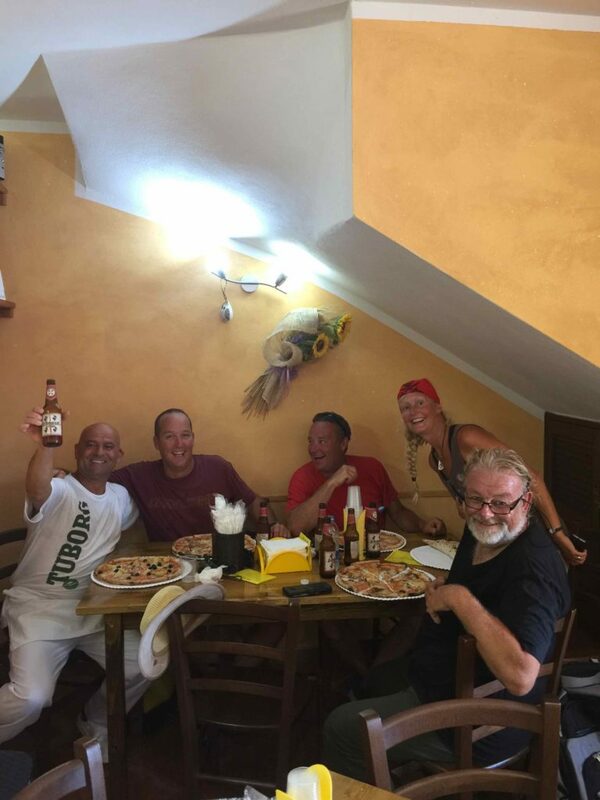 The pizza’s were cooked in the oven before our eyes and were, as we had hoped for, some of the best we ever tasted. 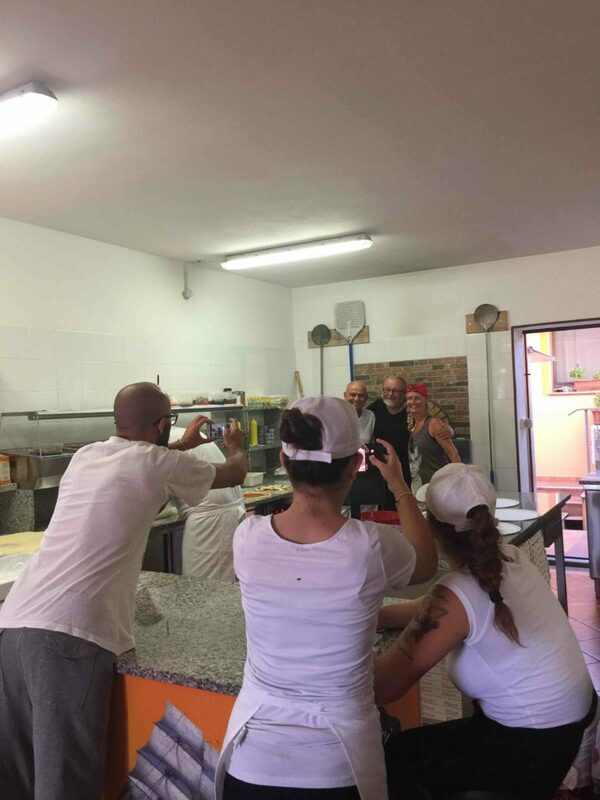 The staff was very entertained by our mixed nationalities group trying to speak some Italian and had great fun taking and posing for photos. 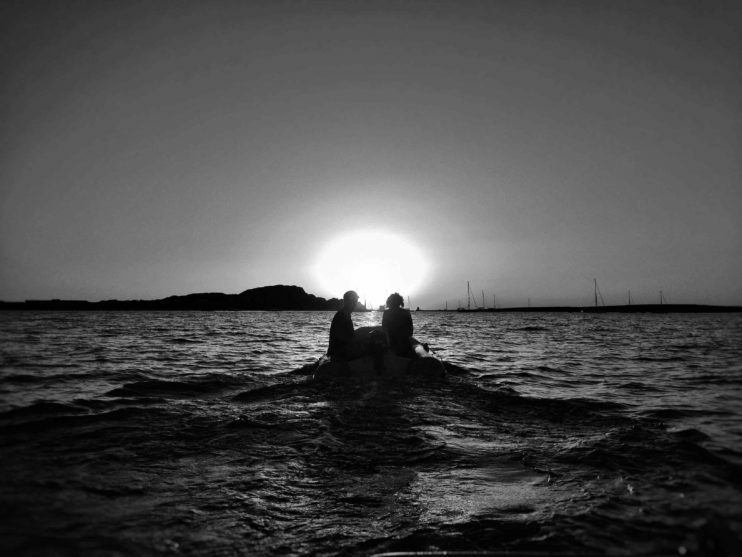 About an hour before sunset we left Stintino with full bellies and high-spirits after our first Italian encounter. 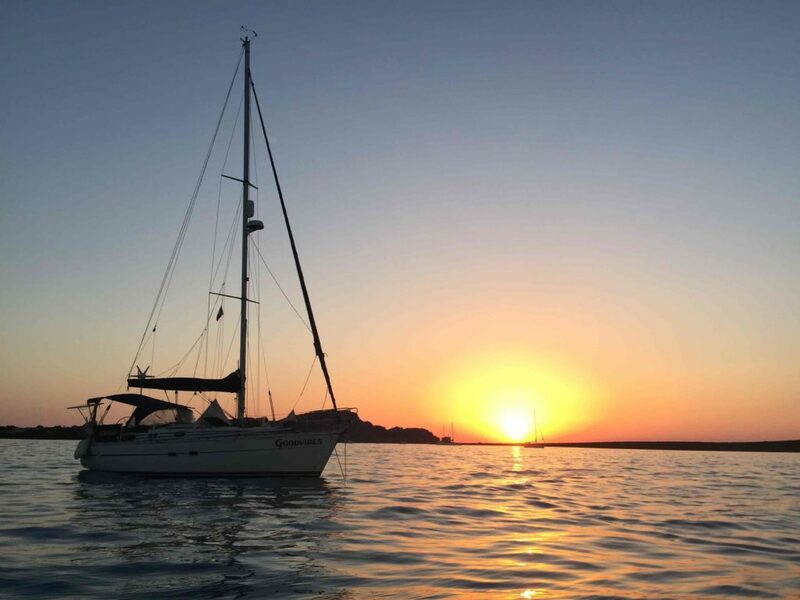 We still had a long dingy ride ahead of us, but the last half we were treated to a fantastic sunset which consolidated the evening as one we would remember for a long time. Very flat waters early in the morning and very little traffic, only a little fishing boat. There were some strong winds forecasted so we decided to move further east for shelter. 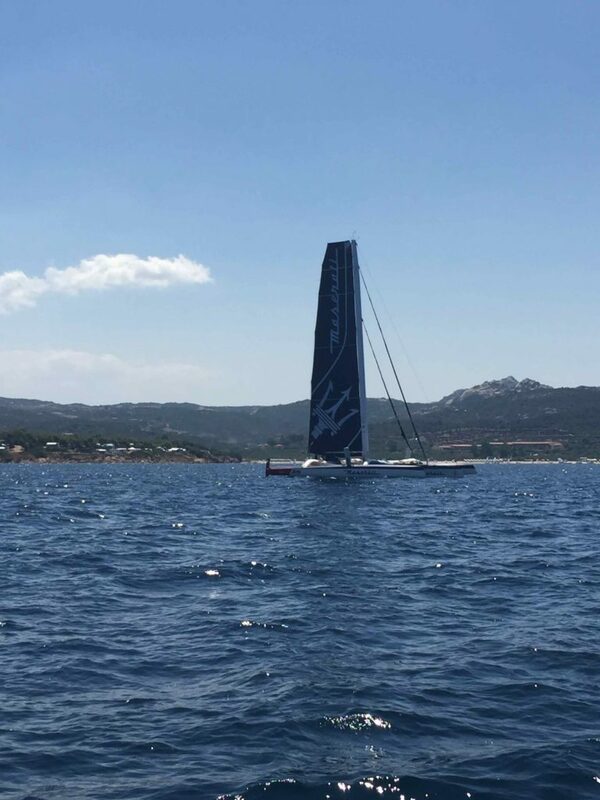 The first half of the 50 mile trip across the large bay between Asinara and the Strait of Bonifacio were on the engine. 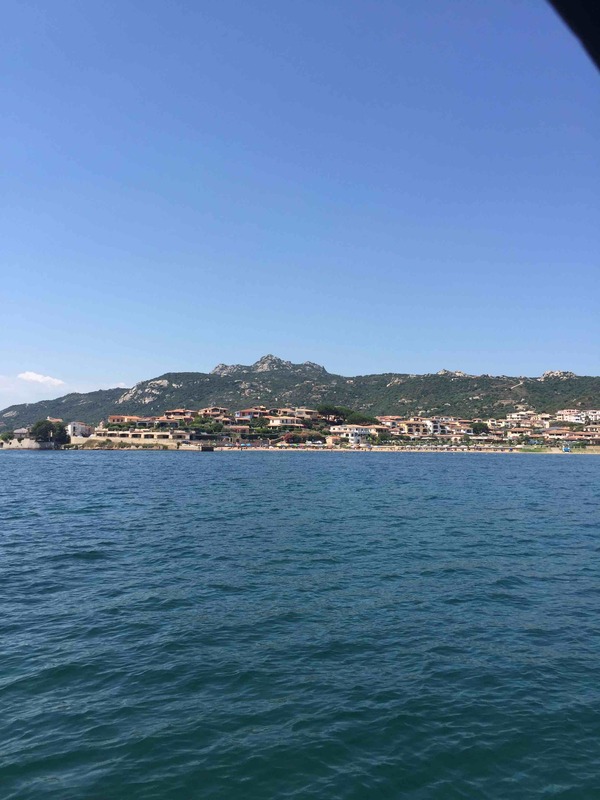 Then the wind picked up just enough for us to sail with a steady 4 to 5 knots to Capo Testa. We were not enchanted by the place: holding was not great, there wasn’t much civilisation ashore and shelter from the strong Westerlies was not super. So we only stayed for 1 night and hauled up the next day for a 10 mile trip around the corner. Some of the strong winds that were forecasted had already arrived and we were clocking over 20 knots apparent wind. 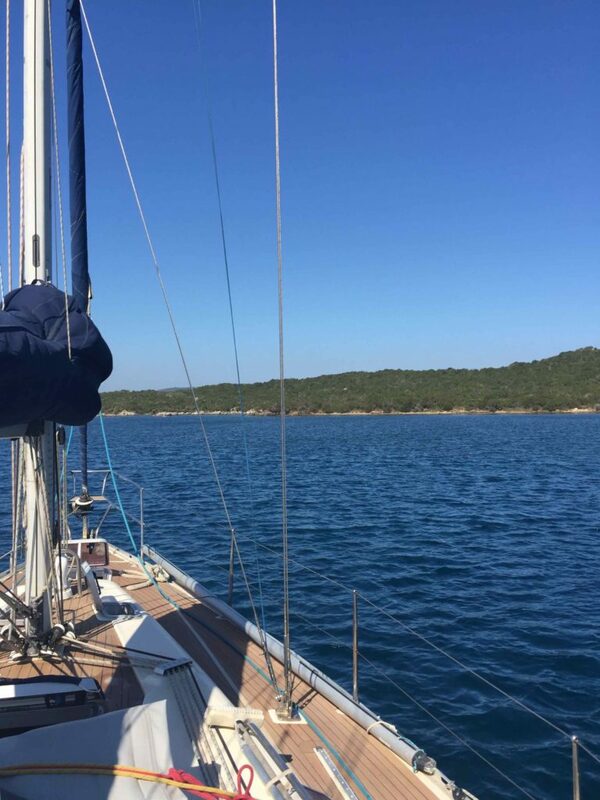 This was fun sailing though: we had to constantly adjust our sails (jib in, jib out – main out, main reefed etc.) and keep an eye on traffic that was increasing now that we were entering the Strait of Bonifacio. s/y Wilma does very well in stronger winds so they beat us to the anchorage. They weren’t too happy with their spot though: they had anchored in 9 meter and had swung around to shallows of only 2.5 meter. By now it was after 3 pm and we hadn’t had lunch yet so we decided to anchor on the other side of the bay where it appeared to be more shallow and there was more sand. We would eat something, check the latest forecast and make a plan accordingly. At that moment the wind was blowing from the East which meant we were being blown offshore but in a few hours it was going to change to the West. In that case we would be better off at the other side of the bay, closer to Wilma. We had a quick bowl of pasta, and made the most of a temporary lull in the wind to re-anchor. Porto Liscia in calm weather. It looks pretty but we didn’t have such a great time here. We dropped in around 5 meters but because the bottom was so steep we soon encountered the same problem as Wilma: when swinging around the depth decreased to 3 meters or even less. Jon decided to dive in to check the anchor and see if we would get too close to real shallow waters (our draught is 1.65 meter). By now the wind had picked up to 20 knots again. I stayed on deck to keep an eye on Jon and on another boat that was attempting to anchor quite close to us. While Jon was under water I could see we were dragging further and further out. Fortunately the wind direction was taking us offshore so there was no risk of ending up in the shallows. We would however end up in deeper and deeper water which meant no chance of the anchor resetting by itself. Jon had also realised that we were dragging and he quickly came swimming back. As soon as he was on board we turned on the engine and hauled up anchor. We dropped again, a little bit closer to land, and left out 40 meters of chain. The wind was still increasing, we were now getting gusts over 30 knots, so we let out another 10 meters and spent the next few hours nervously checking the depth meter. The wind was forecast to be Westerly, in which case we would be more or less parallel to the shore in a minimum of 3 meters depth. If however the wind swung around to more Southerly we would end up in very shallow waters with a possibility of running aground. With so much chain and our now hopefully well-set trusted Rocna anchor out, there should not be any risk of dragging but the experience earlier that day was not very comforting. That night we didn’t sleep very well and we checked every few hours to make sure we were not getting to close to the shore. The next day the blow continued and we spent the day hunkered down inside, crossing fingers we would hold and stay in deep enough water. As soon as the wind died down we were very eager to get out of this unreliable anchorage. In particular, we were keen to get close to a town so we could fill up with water, get rid of our rubbish and do some shopping. We left around lunchtime for another quick ‘hop around the corner’. Even though it was a short trip, it turned out to be fun sailing. 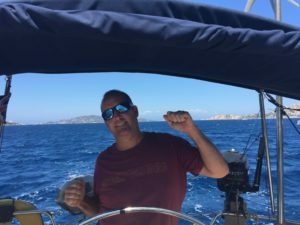 We had a steady 10 to 15 knots behind us and had to gybe many times to manoeuvre between the Maddalena islands in the North and the Sardinian shore in the South. We had heard that this area was very crowded in July and August, but in fact it was pleasantly busy but nothing crazy. We had to avoid some fast ferries and dodged some other sailboats which was really good practice. Possibly one of the prettiest locations to leave the dinghy. 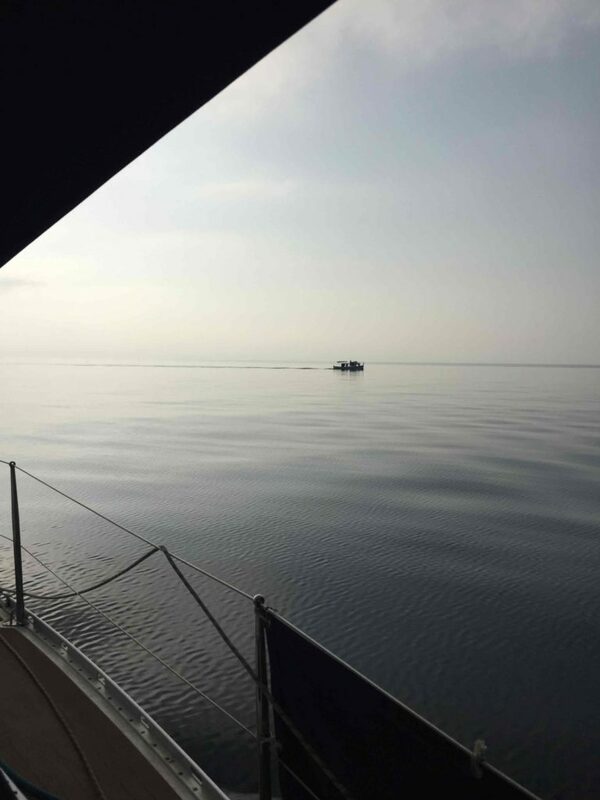 We sailed the entire 10 miles and were pleased to arrive in a large anchorage just off the town of Cannigione. The depth was 5 meter all around so no worries about getting into shallows or deep waters. We did have an issue finding a dinghy dock. Normally there is part of the quay that is designated for dinghies (either formally or informally), or you can leave your dinghy on the beach in quieter places. In Cannigione we scooted around the marina and the shore but there was no obvious place to go ashore. In the end we found a quiet part of beach just outside the town. It is only 5 minutes walk to get to the town but it does make you wonder why the marina or the town doesn’t cater for cruisers in the anchorage to come ashore. At the end of the day, ashore we will spend money. We’ll go to a restaurant or a shop, so it’s in the town’s interest to provide a location to leave your dinghy. Anyway, that’s one of the things you have to worry about as a sailor: how to get on land! 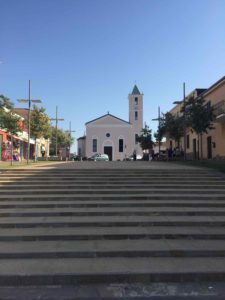 Apart from that Cannigione is a lovely little town with a small chandlery, several pizzerias (one of which we had to test, obviously) and a decent supermarket. 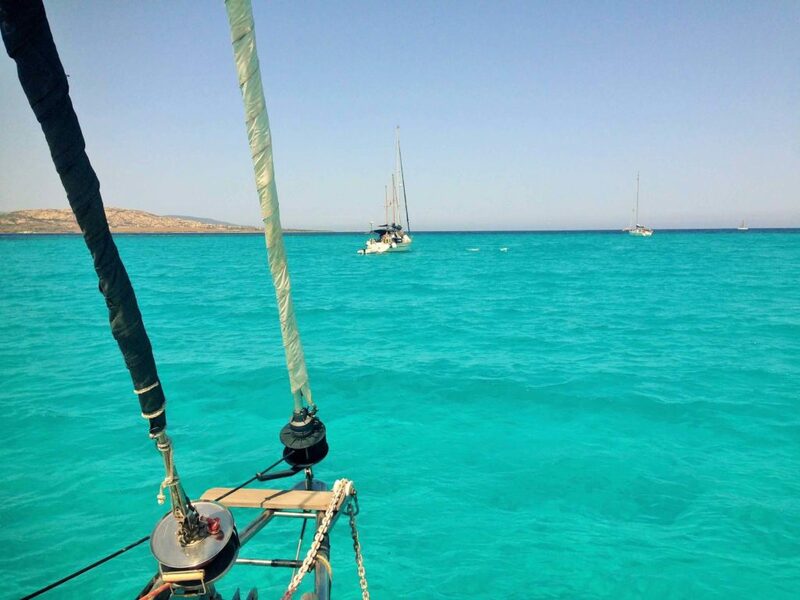 It also makes a perfect base to explore the Maddalena islands, which is next on our schedule. We were surprised how green Sardinia is. This is a public park along the beach of Cannigione. Throughout the town center large photographs like these were displayed. Perhaps the re-enactment of some historical or mythological event? 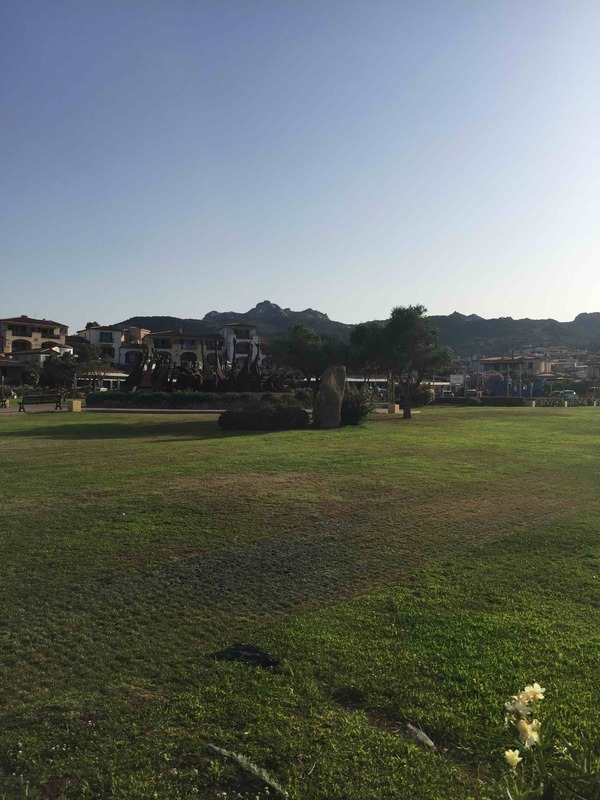 We love North Sardinia, we had a fantastic time there in 2014. Lots of Gorgeous anchorages and really clear water. Enjoy!